It’s been a long time since I’ve checked in with some of my favorite meals, snacks, and workout fuel. And since people are always asking me what I’m eating to fuel my body for training and racing – here are some of my favorites! Training for the 2016 season is ramping up which means quick and easy meals and snacks that taste good and have high nutritional value are key. 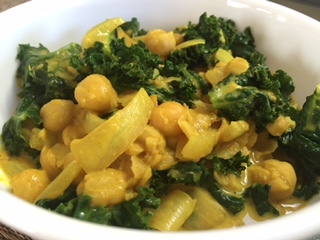 Kale & Chickpea Curry – when I hear curry, I’m sold! This recipe was inspired by an IG user (@raftingveggie) who was inspired by a recipe on VegWeb. So quick and easy to make, you can find my version here. Roasted Tempeh & Veggies – it doesn’t get much simpler than this. 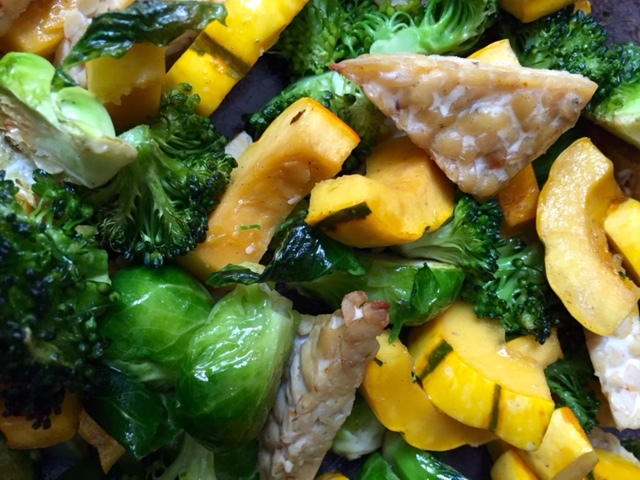 I chop up some veggies (pictured here: broccoli, brussels sprouts, delicata squash), a package of tempeh, toss all of it in a pie plate with some melted coconut oil, and bake for ~30 minutes at 350. 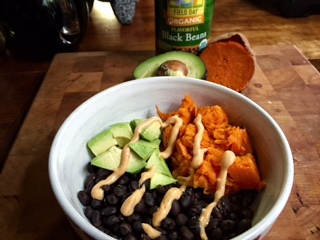 Southwestern Smashbowl – 1/2 cooked sweet potato, 1/2 can black beans, 1/2 avocado. I’ll throw it all in a bowl, and if I have some cashew sour cream on hand I’ll add some Tamerlaine Farm Rudy’s Hot Smoked Red sauce to make it spicy. Then I’ll mash it all together and enjoy! While I am not a fan of processed foods sometimes pre-packaged foods and snacks can make life a lot easier. The key is to find foods that have very few ingredients. 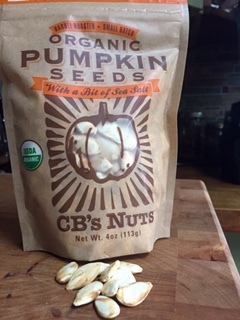 CB’s Nuts Organic Pumpkin Seeds – they taste like buttered popcorn. Enough said. 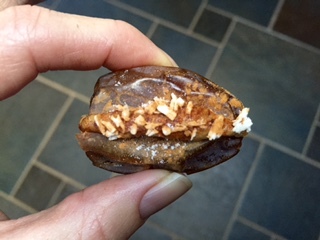 There are 2 ingredients – pumpkin seeds and sea salt. Pumpkin seeds are a great source of iron. 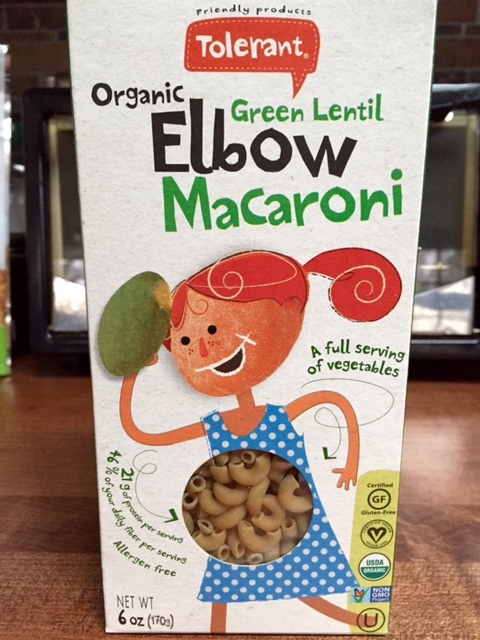 Tolerant Organic Green Lentil Elbow Macaroni – Tolerant Foods has a full line of legume “pastas” and they are awesome! All with one ingredient. A great way to get a healthy dose of protein and fiber. 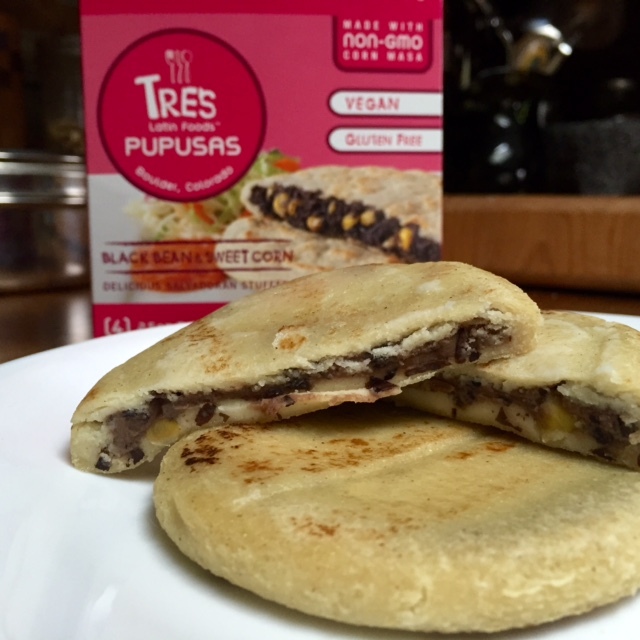 Tres Pupusas Black Bean & Sweet Corn – this is one of two vegan flavors they offer (the only one I can get locally – I need to get my hands on the Kale and Pinto Bean!) I pop these in the toaster oven for 10 minutes and enjoy them with a side of avocado and Tamerlaine Farm Casey’s Hot Super Green sauce. Ants on a Log – what can I say? I cannot out-grow this treat. I have been enjoying this snack every day for at least a month now before my 2nd workout of the day. 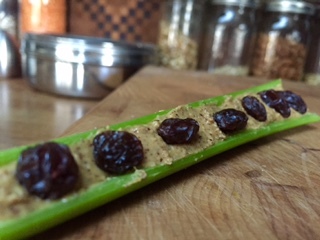 Celery stalks, almond butter, and raisins – BAM! There’s your view into my kitchen to see what I am currently eating. Simple, nourishing meals and snacks that provide sustained energy for my training, and speed recovery. Since this is a taper week and I have a little extra time on my hands, I made one of my all-time favorites from The Post Punk Kitchen. 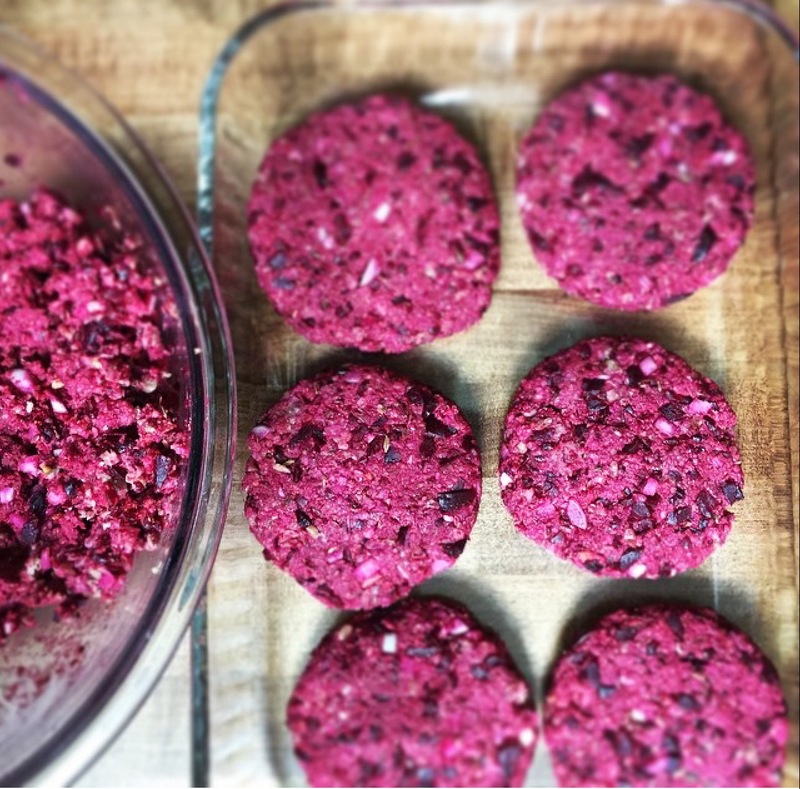 Beet burgers! A little more work goes into making them but it is totally worth the effort! This entry was posted in plant based nutrition, vegan athlete, vegan nutrition and tagged #whatveganathleteseat, #whatveganseat, athlete fuel, Casey's Hot Super Green, CB's Nuts, clean eating, plant based nutrition, plant powered athlete, Post Punk Kitchen, powered by plants, recovery foods, Tamerlaine Farm, Tolerant Foods, Tres Pupusas, vegan, vegan nutrition, whole foods, workout fuel by lljkline. Bookmark the permalink. I’m loving banana bread in the microwave. Mash 2 ripe bananas, add 3T of flour and a dash of cinnamon. Heat in the microwave for 3 minutes. Let sit for a couple, top with PB. Best breakfast!